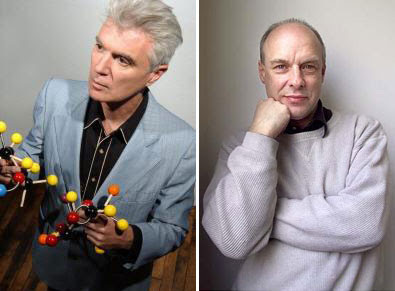 What happens when you mix Brian Eno & David Byrne? Genious of course! After more than 25 years since they last worked together (Talking Heads). These two living legends have gotten back together and recorded some amazing music for us earthlings to enjoy. The album is called 'Everything That Happens Will Happen Today' and it's available for download now on their website, with hard copies out in stores at the end of November. Brian Eno in particular is a favorite of mine! Love the work that he's done throughout the years as a producer and engineer. Pushing and molding bands sounds to their limits. Forcing them out of their comfort zone and making them all the better for it. He's helped shape the sound of many big pop bands of our time, including James, U2, Talking Heads and most recently with Coldplay on their release earlier this year. Here's two tracks from the new album. Can't get enough of Strange Overtones... Gorgeous! David Byrne's voice sounds exquisite! As a bonus here's a classic Talking Heads track 'Crosseyed and Painless' from their 1980 masterpiece 'Remain in Light' which Brian Eno collaborated on. Amazing how well it holds up 28 years later!